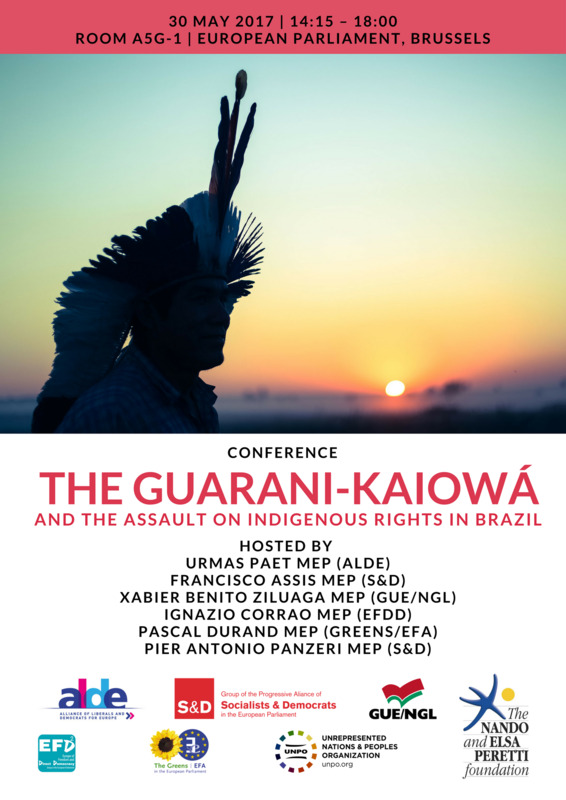 Following UNPO’s fact finding mission to Brazil in late 2016, UNPO is organising a conference at the European Parliament, titled “The Guarani-Kaiowá and the Assault on Indigenous Rights in Brazil”. The conference – organised in collaboration with Urmas Paet MEP (ALDE), Francisco Assis MEP (S&D), Xabier Benito Ziluaga MEP (GUE/NGL), Ignazio Corrao MEP (EFDD), Pascal Durand MEP (Greens/EFA) and Pier Antonio Panzeri MEP (S&D) – aims to examine the indigenous rights situation of the Guarani-Kaiowá people, as well as to identify ways in which the European Union can aid in promoting respect for indigenous rights in the country. The conference will feature Guarani-Kaiowá leaders Ladio Veron and Inaye Gomes Lopes, as well as a number of Brazilian members of congress who will help raise awareness for the cause in Brussels. The Guarani-Kaiowá are an indigenous people living in the Brazilian state of Mato Grosso do Sul, where they inhabit areas of the Amazon rainforest. The integrity of this ecosystem is vital to the culture, livelihoods and health of the Guarani-Kaiowá people. Yet, the ancestral lands of this community are increasingly taken from them to make way for industrial farming of soy, corn or sugarcane. The Guarani-Kaiowá find themselves in a precarious and ever more hopeless situation, with rising child malnutrition and a high suicide rate. Resistance, both from indigenous peoples and from activists, is met with apathy, and often with brutal force. There have been increasing reports of murders, torture and forced disappearances of indigenous people, specifically of indigenous leaders who mobilize in defence of their communities’ land rights. Since 2016, the situation in Brazil has gotten significantly worse as a bloc of politicians within the Brazilian Congress, allied with the so-called ‘agribusiness lobby’, attempts to weaken the institutions which are meant to protect indigenous rights, such as the National Indigenous Foundation (Funai). Besides, violent police crackdowns on peaceful protests, such as those that occurred in Brasilia earlier this month, signal that the situation is becoming ever tenser. During the conference, Guarani-Kaiowá leaders Ladio Veron and Inaye Gomes Lopes, as well as Brazilian politicians linked to the indigenous cause, will provide a first-hand account to help assess the current situation and the challenges that face Indigenous Peoples today. The issues pose a threat to democracy in Brazil, and they are of great concern to the European Union, of which Brazil is an important partner. The European Institutions must encourage respect for internationally established human rights and indigenous rights. In addition to an assessment of the current situation, the panellists will discuss the role of the European Union in ensuring that indigenous and human rights be respected in Brazil and in Latin America in general. Join the Facebook event here, in order to register please contact l.vandiermen@unpo.org. This event will be live streamed on UNPO’s facebook page.